Summary: Princess Diana has spent a few weeks in man's world, and is still pretty disoriented by all the stark differences between the world she knows and the one that exists just outside of it. She doesn't want to get too assimilated into this world feeling a staunch loyalty to her mother and people of Themyscira, but she's also curious about all of the things this new world has to offer. Diana slowly begins to adjust to her new life and starts to talk more, but there is still so much about this world she doesn't know or understand. By her side is her new friend and companion, Etta Candy, who is both curious about who Diana is and where she comes from. Together with Etta, Diana begins to learn more about US culture, its prejudices, and how these limit her opportunities due to her gender. She especially learns the ugly truth about the devastating world war that is destroying innocent lives in large numbers on the other side of the globe. At the centre of the conflict is an entity known as the 'Duke of Deception,' who is wearing the Baelytus--a jewel that was last worn by her mother, Queen Hippolyta. Driven with a new purpose, Princess Diana decides that her place is not within the comforting borders of United States of America, but in Europe where half of the war is taking place. She also intends to find this Duke of Deception to find out what happened to her mother, and stop him from destroying more lives. Along the way, she is reunited with an old friend she thought she had lost following her departure from Themyscria: the soldier who's life she previously saved, Steve Trevor. Review: I humbly apologise for being late with this review, especially since Legend of Wonder Woman #6 came out today. Between Captain America: Civil War, Mother's Day in the US, Earth-2 news, plus three brutally exhausting work weeks, I've found myself working on this review bits at a time these past weeks, and barely a full day to say everything I want to say and actually make it sound coherent. Now that I have a full day to myself, hopefully this post flows better than my last two posts on this blog which were written kind of in a rush. Continuing where the last issue left off, Legend of Wonder Woman #5 sees Diana's adjustment period to a world completely unfamiliar to her. There's so much about the outside world she doesn't understand and a lot more that she's curious about. As the proverbial fish out of water, Diana really stands out as someone who has never experienced 20th century culture and technology, a detail that doesn't go unnoticed by Etta Candy's friends, the Holliday College girls. Despite Diana coming off as someone a 20th Century person would describe as 'odd,' 'sheltered,' or 'living under a rock,' she is nonetheless treated with respect by both Etta and the Holliday girls, and is never dehumanised nor humiliated for being different in this openly prejudiced era of world history. The best part is that writer Renae De Liz is able to present Etta and her friends as being dumbfounded (if maybe a little fascinated) by Diana's ignorance of the outside world without presenting them as mean or nasty. She effectively subverts the 'mean girls' stereotype. Another thing I really enjoy about this chapter is the way Renae De Liz juxtaposes the Amazonian Diana with the 'All-American girl' Etta Candy. It's very much a case of juxtaposing a woman who did not grow up within the confines of patriarchal society and one who has, and it reflects in the way both women see themselves and even in the things they prioritise. 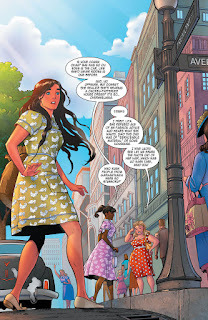 Diana, for example, does not concern herself with her appearance as evidenced by the fact that she is not bothered by her choice in clothes (in this case, the chicken patterned dress), whereas Etta does actually concern herself about something as seemingly trivial as that. Not only does she want Diana to wear a 'better dress' (or at least one that's to her standards), but she also wants to apply make-up to her face. The interaction between Etta and Diana in this chapter does pose the question of whether or not Etta would still be concerned about appearance if she didn't exist within a patriarchal society that pressures women into looking a certain way. On the flip-side, it also gets the reader to think about whether or not Diana would similarly be conscious of her appearance if she had grown up in a patriarchal society with those same pressures on women the way Etta has. It is definitely a question that Diana's existence challenges, which is a huge part of what made her stand out as the Wonder Woman Charles Moulton Marston envisioned in the 1940s. But it isn't just Diana who challenges commonly accepted views of women as objects, useless, and weak, but Etta does so as well in her own unique way. Despite Etta having internalised much of her country and culture's institutional sexism, she also prides herself in being different and sees herself pursuing stardom as a singer. She also doesn't allow anyone to disrespect her and puts up a fight whenever she feels wronged, which stays true to the character Marston himself wrote 75 years ago. Another thing that's equally fascinating about the juxtaposition of Etta and Diana is how their characters represent their respective societies, where they have progressed and where they haven't. Despite being an ancient civilisation, Amazonian culture and values are considerably more advanced than those displayed by the more technologically advanced 20th Century America, particularly where the worth of women is concerned. Whereas Amazonian culture celebrates women's accomplishments, 20th Century America outright ignores them and instead treats women as second class citizens at best, and as objects at worst--a reality that disturbs Diana. Nothing epitomised the reality of American sexism more than Diana's trip to the cinema where she saw a film adaptation of Shakespeare's A Midsummer Night's Dream that saw her mother (Queen Hippolyta) depicted as the subdued love interest of Theseus, which offended Diana. Diana equally learnt the pervasive nature of sexism the hard way when she tried to sign up to fight in the war in France and she was turned down because of her gender. In addition to Diana's experience with sexism just fresh out of Themyscira, Etta was equally victimised by it when her own parents decided to use her face in an incredibly humiliating ad to sell a depilatory cream they'd developed. Not only did unlawful use of Etta's face violate Etta's civil rights, but it also made Etta's parents appear abusive towards her by disrespecting her wish not to see her face used in this manner. It even provided her rival, Pamela Smuthers, with ripe opportunity to humiliate her. In addition to the meta commentary on sexism in this chapter, this Etta Candy and Diana-centric instalment was also a beautifully crafted story about friendship between two women. It was made clear throughout this chapter that both women face very different personal battles in their lives but also bonded over a desire to do good. 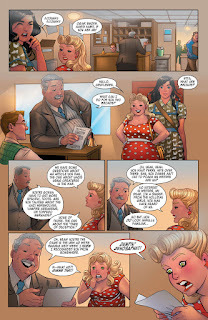 Etta Candy is ambitious and wants to make her mark on the world, but she also wants to be there for other people in helpless situations. Even though she's known Diana for a few weeks, she felt it was her responsibility to look after her and help her adjust to her new setting, even if it can be trying exercise. Etta's friendship not only benefits Diana as her guide to the outside world and allowing her to find her strength within it, but Diana's friendship is equally valuable to Etta as well. As a foreign woman who breaks all the gender rules of patriarchal society to pursue her own endeavours, Etta also finds her own inner strength through her interaction with Diana, and even inspires her to pursue things (like volunteering in the war efforts overseas) that she otherwise wouldn't have pursued on her own. De Liz does an excellent job at developing the friendship between Diana in Etta in an incredibly organic way within a 30 page space. Other exciting things and easter eggs that happen in this chapter is the cameo of a very young Perry White from the Superman comics working for a tabloid newspaper. One thing I found very interesting about Perry in this chapter is that De Liz alludes to the fact that he will eventually found and become the editor in chief of the Daily Star. While Perry White did eventually become the editor in chief of the Daily Star in the actual Golden Age, it is also worth noting that he didn't actually found the Star since he was preceded by another character, George Taylor, as the editor in chief in those very early years of Superman comics. Whether or not De Liz was aware of this fact I don't know, but I do think the idea of Perry founding the Star itself makes sense since he is the most visible editor at this publisher. Maybe within De Liz' canon, he'll co-found the Daily Star with George Taylor, and maybe later succeeds him as the chief editor? It would honestly be interesting to see. Another potential easter egg in this chapter is that a guy named 'Kent' was named off panel in the army recruitment office. My first thought was Kent Nelson, who is Doctor Fate and also a founding member of the Justice Society. I don't know if this was intentional or not, but I nonetheless told myself it was Kent Nelson anyway. In the original Golden Age canon, he did actually fight in the second World War, both as Doctor Fate and as a civilian. If De Liz has him show up at some point (most likely as a civilian) before this volume concludes, I'll definitely squee like a little girl. Kent Nelson is one of my favourite Justice Society characters and I think De Liz would be great at capturing his confident personality, and especially his affinity for making snarky remarks. 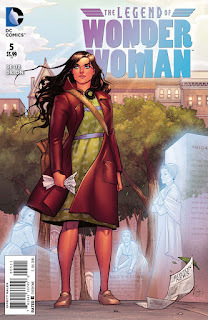 On the whole, Legend of Wonder Woman #5 continues to be a satisfying continuation of Diana's journey. It provides a lot of meta commentary on 20th century sexism (most of which is sadly still relevant today), but it's also a story about friendship between two women looking to make their mark on the world. Next Wednesday, we have this week's Legend of Wonder Woman #6 to review! (So happy I'll be having a free weekend for once this month).